DTM is best when you have a large enterprise, 10,000+ web pages to deliver and requires secure proprietary web data. It does require pre-planning, strategy and staff to implement, managed and test prior to going live. For smaller website implementations, Google Analytics is free, easy to implement and analyze. If needed to deploy pixels in no time, fast - this is an ideal candidate.Less if you need special targeting rules as these are a bit behind - compares with Google Tag Manager. Because Adobe Analytics requires adding DTM tags to the site, it does require some basic web development skills to ensure it does not impact pageload speed. When working across a large organization with many developers, it is equally important the developers do remove the code, lacking the understanding of what it is. The utilization of eVars, Sprops, and events to tag a website, creates a learning curve for technical teams. There is a gap in knowledge of UX | UI design and the strategy of what should be measured and treated as a click event vs. pageload. When consulting within the business team, try to refrain from talking eVars, Sprops and events. It is simply too confusing and is much easier to ask what are the online behaviors or interactions that are most important across the site or on the page and then translate those into a DTM tagging strategy and prioritization. Don't try to tag everything! Which often results in over engineering, too many technical resources spending too many hours tagging and testing. Quantity of data is not the same as quality. Being able to preview in the same way Qubit Deliver experiments can be previewed would be a great feature before publishing changes. As it interfaces so well with AMO, we shall be utilizing the DTM for any future client additions. Qubit has supported us with our business goals and continues to do so. It does exactly what it is designed for in a very user friendly fashion. Although it is a newer product to Adobe, they seem to truly care about our challenges and are very proactive in making sure that we have the most knowledgeable support available in a timely manner. It was quite seamless with the outstanding support from our Adobe account manager. Adobe DTM provides a more secure data analytics solution. It is customized and best used on large scale deployments of websites with pages 10,000+. The Adobe Analytics tool, once learned, is very easy to use and provides more robust, customized graphics and ability to export data to "securely" via FTP from the cloud to SQL database. Qubit is much easier to use and select object vs. Google Tag Manager. Excellent ROI investment "if" strategy and roll out are prioritized appropriately. Because this is a custom solution, Adobe does not provide this level of guidance. From a project management timeline perspective, if the team rolling this out tries to tag everything, then they will quickly run out of time and overextend resource hours. One of the most obvious and beneficial features is the huge reduction in HTTP requests, giving us a great site performance benefit. 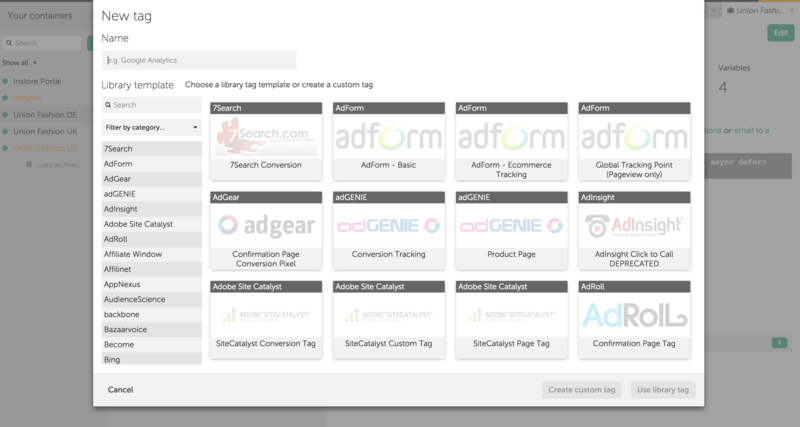 Managing all of our tags in one place has removed a lot of potential complications.